Recommend Perea Clinic and Get Rewarded! Join 95% of clients that have recommended Perea Clinic to friends and get credits! Recommend us to your friends. 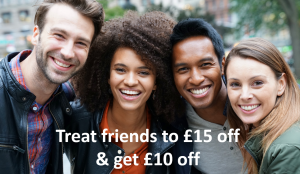 When you treat friends to £15 off their first treatment with code: FRIEND15 – you get £10 credit. Redeem credits as treatment payment! Many of our clients visit us after a recommendation from a friend. As many 0f you have been recommending us to friends, we would like to give every one of you a reward to say thank you. That’s why we’re very excited to introduce Perea Clinic’s Treat A Friend reward program. You get rewarded with treatment credit for every new friend that visits us. 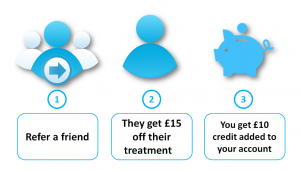 There is no limit to the number of friends you can recommend, treat enough friends and your next treatment could be free. Recommend us and give your friends a free discount! Make sure your friend tells us you recommended us when they book online or instore. Start collecting credits and tell your friends about us now!